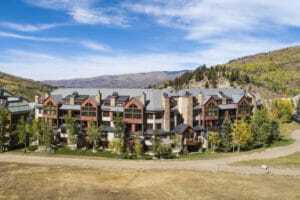 After 26 years, extreme Colorado weather conditions had battered the exterior of the Highlands Slopeside condo complex in Beaver Creek. To give the five-story structure new life, a comprehensive face lift took place in 2016 and 2017 involving new windows, siding and custom masonry rock. More than 500 squares of composite multi-width slate roofing from DaVinci Roofscapes topped off the major exterior renovation. In order to complete the renovation project during “off season,” the team at Arapahoe Roofing had to put in some long hours. “We were permitted to work on the composite roof for seven weeks during two separate summer timeframes in 2016 and 2017,” says Mark Bellitt, president of Arapahoe Roofing & Sheet Metal, Inc. out of Louisville, Colorado. “Our crews worked 12-hour days, six days a week to meet the tight deadline. Making the re-roofing task even more challenging was coordinating the project with other construction workers who had the structure fully embraced in scaffolding to perform the many exterior upgrade projects underway. “On any given day we were working on the composite roof replacement while other tradesmen were installing windows, stucco, stonework and wood siding,” says Bellitt. Before the Arapahoe team could start installation of the composite slate tiles, a decision was needed on the DaVinci color for the facility. After Bellitt shared with the property management team that DaVinci had previously created a unique Beaver Creek color blend for other housing projects in the area, the decision was an easy one. Designed to complement the natural mountain setting, the custom Beaver Creek blend consists of three shades of greens, two shades of tan and four shades of gray tiles. With the project underway, the first step for the Arapahoe crew was the removal of the existing concrete tile roof over the 36 luxury condos along with the existing cold roof. “We took old product off down to the original steel deck,” says Bellitt. “Then we started the installation with a layer of four-inch roof insulation adhered to a second layer of four-inch nail base. Next came custom copper flashings. 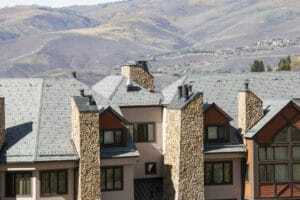 The Arapahoe team installed more than 540 squares of the DaVinci Multi-Width Slate tiles and 140 squares of copper standing seam metal roofing on the project. The average roof pitch was 12/12. Along with the new composite roof system, a new Byline heated eave system, custom copper chimney caps, new snow fences at all roof eaves, new copper gutters and down spouts, and more than 2,500 snow guards were installed. In addition, the team re-installed brackets on the copper roofs and replaced snow fences at the eaves. “This project used our RG 16 style snow guards in Dark Bronze powder-coated steel,” says Lars Walberg, president of Rocky Mountain Snow Guards. “These particular snow guards were chosen because of their clean appearance and exceptional strength. Once completed, the roofing portion of the project won the Colorado Roofing Association Job of the Year Award in 2017 for Arapahoe Roofing.